Description: Here is the first ultra-high denomination issued by The Dominion of Canada. It shows a portrait of Queen Victoria. 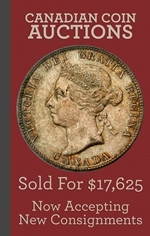 Varieties: Five hundred dollar bills from 1871 can be listed as payable at Ottawa, Montreal, Toronto, St. John, Halifax, Victoria, Winnipeg, or Charlottetown. All varieties are very rare. Text: The Dominion Of Canada – Will Pay to The Bearer On Demand – Five Hundred Dollars July 1st 1870 – Authorised By 31 Vie. Cap-1-6 -British American Bank NOTE Co Montreal Ottawa. 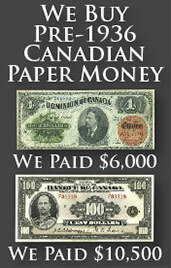 We buy all 1871 $500 bank notes from The Dominion of Canada. These are very rare and prices aren’t really established. If you would like our offer, then please send us pictures of your bank note. We will grade the paper money and respond back quickly with our buy and sell price. You might be surprised at how much money these can be worth.